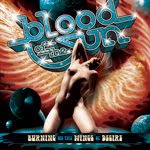 RockUnitedReviews: BLOOD OF THE SUN: "Burning On The Wings Of Desire"
BLOOD OF THE SUN: "Burning On The Wings Of Desire"
Straight to the point, Blood of the Sun are sadly stuck in a timewarp where the early seventies sideburns fashion is still the king. Indeed, welcome to cliché city since you're greeted with all the typical ingredients of the groovy past. In fact, they are all present on their new album, 'Burning on the Wings of Desire', - the hammond, the spacey arrangements, the psychedelica, the boogie, and obviously the blues. The only thing missing, decent original compositions. We've heard it all before. Tony Reed of Stone Axe (another zzzz... eventies sounding act) plays guitar and bass as well as produces the album. Blood Of The Sun is however the band of former St. Vitus drummer Henry Vasquez and it's so 'been there, done that', that we'd rather watch wet paint dry.